Harvey Harrison has done it again -- event scheduling and processing is about 50% faster in this week's release (2014-36). On my laptop, the benchmark runs at nearly 8 million events/second compared to 5 million last week. It wasn't many months ago when I was excited about 2 million events/second. The following graph shows the full results for the benchmark. A new entry on the above graph is the result for SLX from Wolverine Software. The developer, Jim Henriksen, had sent me this result several months ago along with the input file. The results for other two benchmarks were described in a post Jim made to the LinkedIn group for the Society for Modeling & Simulation International a few weeks ago. You can read his post here. Ideally, I should re-run the SLX benchmarks myself, but have not found the time to explore SLX enough to do so yet. In the interest of keeping things moving, the results Jim provided are shown in all the latest graphs. It is fair to say that SLX sets the gold standard for execution speed. This is one of its key features, and SLX achieves this status by being the only simulation software to provide a compiler for its proprietary programming language. Somewhat more effort is required to build an SLX model -- there is no drag and drop model building environment -- but the pay-off is the shortest possible execution time. 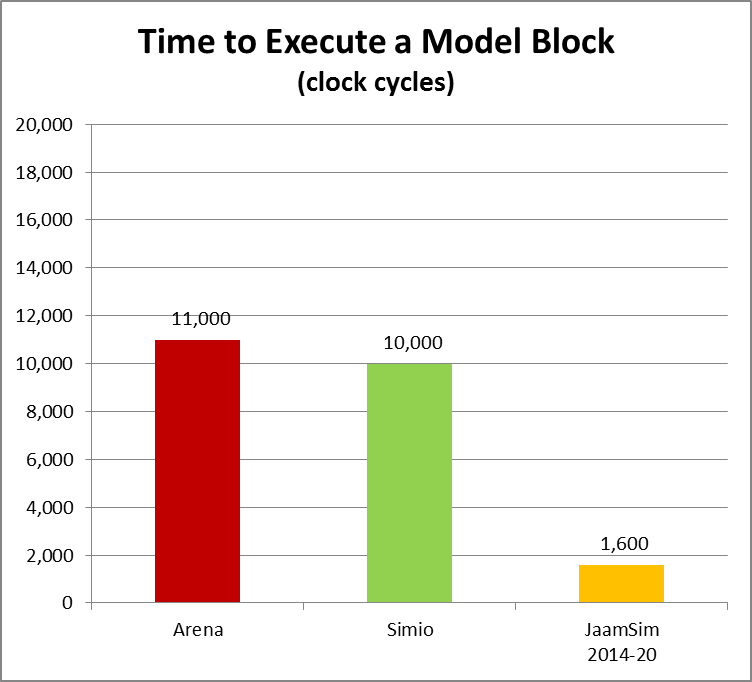 With Harvey's latest improvements, JaamSim processes events about 6 times faster than Simio, but is still about 2.7 times slower than SLX. JaamSim's event processing code is unlikely to get any faster -- all reasonable optimizations have been made already -- so we will have to accept that SLX is faster in this area. To be completely honest, we were pleasantly surprised to have got this close to SLX. To put the event processing speed differences in in perspective, consider a model that requires one billion events to be executed. On my 2.5 GHz laptop, the event processing portion of the simulation run would total 13 minutes in Simio, 2.1 minutes in JaamSim, and 0.8 minutes in SLX. For this number of events, the difference between SLX and JaamSim amounts to only 1.3 minutes out of what is likely to be a much longer total duration for the run. 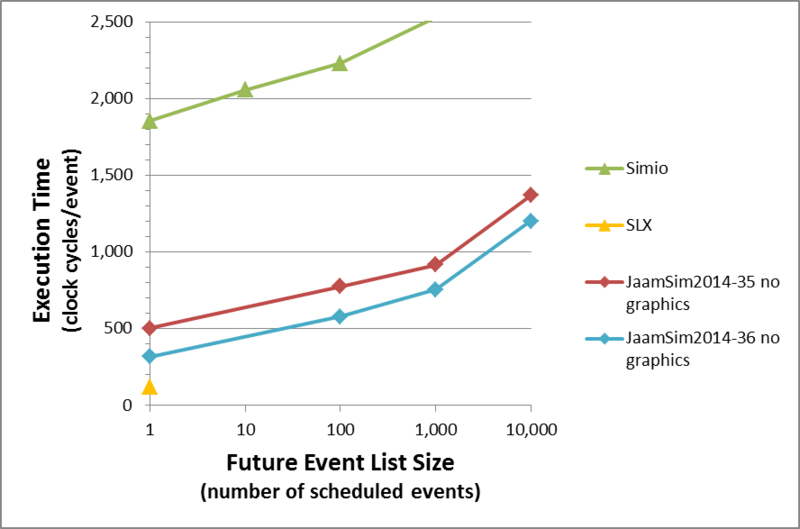 Nearly 10 billion events would be required for the difference between SLX and JaamSim to reach 10 minutes. Beyond 10 billion events, SLX is likely to have a significant advantage over JaamSim. Below 1 billion events, the difference is likely to be insignificant. 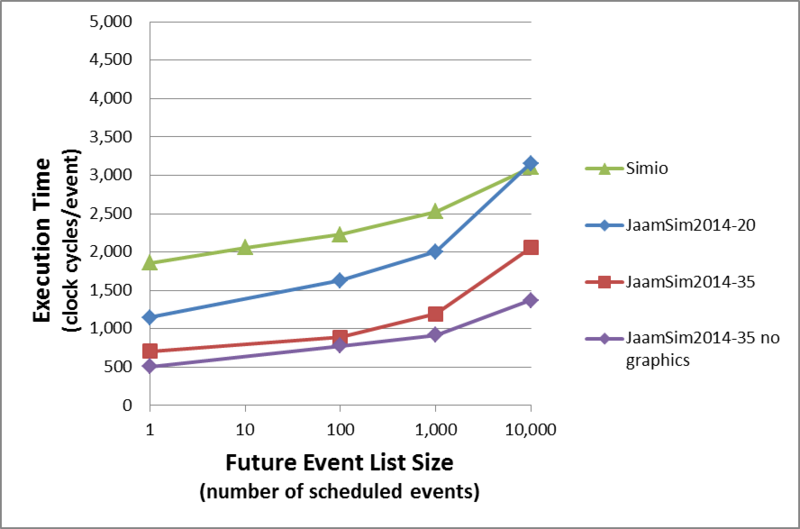 Now that we have good performance for event processing, our next objective is to bring JaamSim's event creation/destruction time into line with the other benchmarks. SLX achieves its excellent result for this benchmark by providing an internal entity pool, so that used entities can be recycled instead of being destroyed. Up to now, we have shied away from an entity pool for JaamSim, preferring to focus our attention on making entity creation more efficient. Moving forward, we may have to reconsider various ways to implement an entity pool.